This Instant Pot Thai Chicken recipe is one of the most requested dinners in our house. 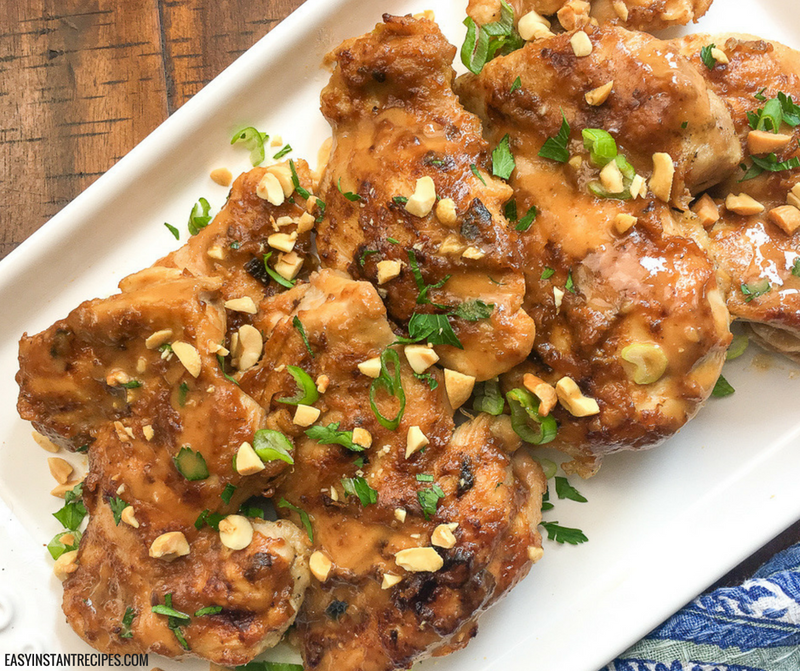 I never in a million years expected my kids to enjoy peanut butter chicken, but they go nuts for this! When it comes to this recipe there are a couple tricks to keep in mind. When cooking in a pressure cooker, meals can come out a tad on the watery side. This can be caused because of many different reasons, and this recipe has no exception. I have found that we tend to run into this when we use good chicken. One trick to combat a watery pressure cooker meals is to cook in rice or pasta after you have cooked your meal. This tends to be what I do whenever I open our Instant Pot lid and dinner looks too watery. However, this trick is one that you need to be able to eyeball, so if you are new to pressure cooking I wouldn’t recommend it as there is a really high chance that you will end up with crunchy rice or noodles. An easier trick is to add in some cornstarch after cooking your meal. And AFTER is key. If you try to include cornstarch before cooking you will end up with a burn notice. To do this simply add in a tablespoon at a time, after cooking, and mix it in. Or for an even easier option, you could just simply boil the excess water off by stirring constantly while on sauté mode until the liquid is reduced. When I make this recipe for my kids, there are some adaptions that I may make (depending on which ones of them are home for dinner). For the girls, we can do full on spice, but if the boys are home spice is an absolute no-go. To modify the Thai Peanut Chicken for them I simply leave out the sriracha and ginger. It will make the recipe a bit on the bland side, but its still absolutely delicious. Want some flavor but not the heat? Then simply leave out the sriracha. This peanut butter chicken is ridiculously simple to adapt to your taste buds. Not making this Instant Pot Thai Peanut Chicken right this second? Then pin this post so you can easily find it later!